You’ve heard so many great things about the Indie Craft Parade VIP Gala, and now you have a chance to win two tickets! This is an opportunity you don’t want to miss. The VIP Gala is your best chance to get to know the artists and get first dibs on their work. With Indie Craft Parade being such a heavily attended event, the Gala allows you to avoid the crowds of Saturday and Sunday. Not to mention the other great perks for attending Friday night: free food and drinks from some of our favorite local establishments and a host of fabulous giveaways. Food will be provided by Ribault Street Catering, drinks from Community Tap, and a coffee bar by Coffee and Crema. This is also the night to win giveaways — baskets of handmade goods straight from our vendors’ booths. We’ll also have live music from The Bent Strings that night, so come and enjoy it. 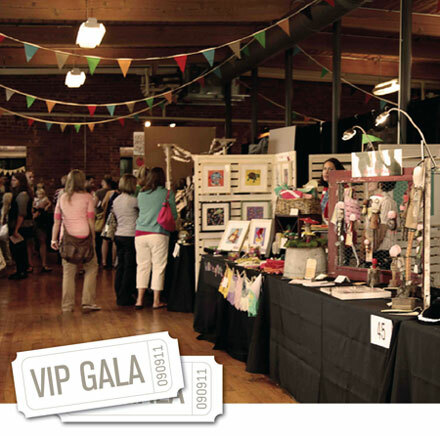 The VIP Gala will be held on Friday, September 9 from 6 to 9 pm at the Huguenot Mill in downtown Greenville, SC. This ticketed event kicks off the festival weekend, and helps support our artists and the mission of Indie Craft Parade. Check out the full details on our website! So, how do you get these 2 free tickets? Head over to the ICP Blog, and leave a comment on the giveaway post. The winner will be chosen at random and announced on Monday, September 5. Don’t want to take your chances? You can purchase VIP Gala tickets here and be guaranteed a place at the party!